Now that you have Ardour installed on your Mac, let's start it. First you have to open and start JACK (JackPilot) as described in the previous section. Then, simply double-click on the Ardour icon in your Applications folder. OS X may warn you that Ardour is an application downloaded from the internet. Click 'Open' to confirm you want to open it. 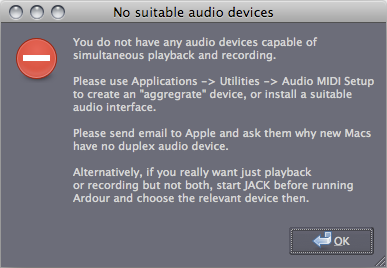 If you are using a newer Mac (Powerbook 2007 or later), Ardour may give you an error stating that 'you do not have any audio device capable of simultaneous playback and recording'. This is because newer Apple machines see input and output as separate devices and do not have an aggregate device configured by default. Refer to the Configuring the Soundcard for post-2007 PowerBooks & MacBooks chapter for information on how to fix this. Otherwise the Session Control window shows up. Name your new project and click on New. 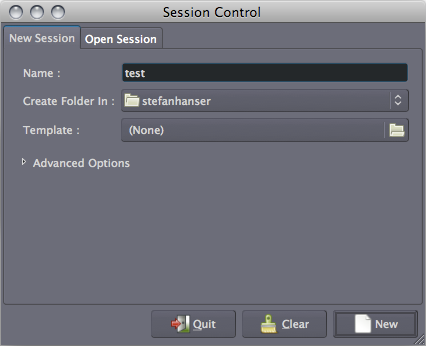 This same window can be used to open existing sessions by clicking on the Open Session tab.